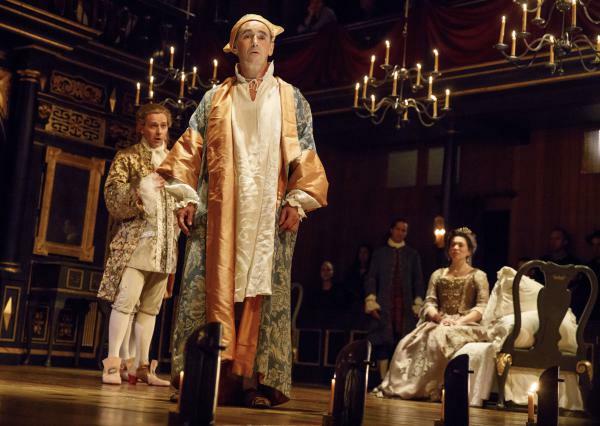 Mark Rylance (center) plays King Phillipe V in the new play Farinelli And The King. In this scene, opera star Iestyn Davies (left) plays the titular singer whose voice nurses the king back to health. The story of Farinelli was the subject of a 1994 film which only lightly touched on his two decades in Spain. He was there to minister to Phillipe V, whose grandfather was Louis XIV and arranged a marriage alliance that would make Phillipe the Spanish king. "And this poor man was absolutely unsuited to that job," van Kampen says. "He really had a brilliant mind for maths and science and he kind of wanted to be an academic. But he had a very, very severe bipolar disorder. And he found life terribly painful and difficult." With no other medical options, the queen tries a kind of baroque music therapy. She travels to England to ask Farinelli, an operatic superstar, to sing for the king. That's the subject of van Kampen's new play, Farinelli And The King. The Academy and Tony award-winning actor Mark Rylance stars as King Phillipe. "We know historically that the singing of Farinelli had a huge impact on this king and enabled him to return to his functioning self," Rylance says. "But we don't really know why or how. We also don't know why Farinelli decided to give up his whole career — in my understanding a career equivalent to Michael Jackson's in terms of fame and fortune and adoration. And he gave it all up really at the height of it, to stay and sing for this king." Farinelli was a castrato — a singer castrated as a child to create an unnaturally high voice. The practice was barbaric — many died from the operation, and many who survived committed suicide. It was outlawed in the 19th century. Playwright Claire van Kampen says Farinelli sees in the king something of himself. "Farinelli is a divided person — he's divided from parts of himself, physically," she says. "But psychologically, I feel he's very divided between this person that has been forced to go on and artificially create a persona of this great opera star, but inside he's simply Carlo Broschi — that's his name." To create that split personality, van Kampen and director John Dove have an actor play Farinelli in the scenes and a countertenor — a male singer with a high voice — sing the part. "We were inventing as we went along what kind of an evening it was," Dove says, "'cause it's not quite a play, it's not quite a musical. It's a hybrid. It's its own thing." The singing Farinelli is played by countertenor Iestyn Davies. He says the king and the singer, each uncomfortable with their public personae, become close friends. "They kind of recognize something in each other, which throws off the kingship and throws off the stage persona of Farinelli," Davies says. "And they're able to connect on a human level." Davies is a major opera star and van Kampen says it was a coup to get him to commit to a Broadway run from a first-time playwright. It might also seem a coup to get an actor of the caliber of Mark Rylance for the production — except he happens to be her husband. "I'm just so proud of her and thrilled for her," Rylance says. "She spent 25 years supporting me and giving me brilliant ideas without anyone realizing it was her. Now, for her to be celebrated for the clever artist that she is, it gives me a great thrill." Their collaboration was a success on London's West End, and Farinelli And The King is now running on Broadway through March. Let's hear about a new play on Broadway starring Oscar-and-Tony-Award-winning actor Mark Rylance. It's called "Farinelli And The King," and it's set in 18th century Spain. The play tells the story of the unlikely relationship between the king, played by Rylance, and the singer whose music nurses him back to sanity. Jeff Lunden reports. JEFF LUNDEN, BYLINE: Several years ago, Claire van Kampen was composing music for a London theater production. During a break, one of the singers asked her if she knew the story of Farinelli, the famous 18th century opera singer. CLAIRE VAN KAMPEN: You'd really like the bit where he goes to Spain and sings to King Philippe who has this bipolar disorder. And then I started to think, now that's an interesting story that I haven't heard about, seen. LUNDEN: The story of Farinelli was the subject of a 1994 film which only lightly touched on his two decades in Spain. He was there to minister to Philippe V, whose grandfather was Louis XIV. He arranged a marriage alliance that would make Philippe king of Spain. VAN KAMPEN: And this poor man was absolutely unsuited to that job. He really had a brilliant mind for maths and science, and he kind of wanted to be an academic. But he had a very, very severe bipolar disorder, and he found life terribly painful and difficult. LUNDEN: With no other medical options, Philippe's wife, the queen, tries a kind of baroque music therapy. She travels to England to ask Farinelli, an operatic superstar, to sing for the king. IESTYN DAVIES: (As Farinelli, singing in foreign language). LUNDEN: And it helped, says Mark Rylance, who plays Philippe. MARK RYLANCE: We know historically that the singing of Farinelli had a huge impact on this king and enabled him to return to his functioning self but we don't really know why or how. We also don't know why Farinelli decided to give up his whole career, in my understanding, a career equivalent to Michael Jackson's in terms of fame and fortune and adoration. And he gave it all up really at the height of it to stay and sing this king. LUNDEN: Farinelli was a castrato, a singer castrated as a child to create an unnaturally high voice. The practice was barbaric. Many died from the operation. Many who survived committed suicide. It was outlawed in the 19th century. RYLANCE: (As Philippe V) Your voice, it's not natural, is it? UNIDENTIFIED ACTOR: (As Farinelli) No. RYLANCE: (As Philippe V) Neither is it natural for me to be king, you know that? RYLANCE: (As Philippe V) Do you dream? UNIDENTIFIED ACTOR: (As Farinelli) No, or at least, I forget them before I wake up. RYLANCE: (As Philippe V) All of us dream. Most of us would prefer to forget our dreams. Perhaps you need to forget yours. When were you made a king? UNIDENTIFIED ACTOR: (As Farinelli) I am not a king. RYLANCE: (As Philippe V) I'm afraid you are. We were both made kings against our will, I suppose. LUNDEN: Playwright van Kampen says the reluctant king and the superstar are not all that different. VAN KAMPEN: Farinelli is a divided person. He's divided from parts of himself physically. But psychologically, I feel he's very divided between this person that has being forced to go on and artificially create a persona of this great opera star, but inside, he's simply Carlo Broschi. That's his name. LUNDEN: To create that split personality, van Kampen in director John Dove have an actor play Farinelli in the scenes and a countertenor, a male singer with a high voice, sing the part. JOHN DOVE: We were inventing as we went along what kind of an evening it was because it's not quite a play and it's not quite a musical. It's a hybrid. It's its own thing. LUNDEN: The singing Farinelli is played by countertenor Iestyn Davies. He says the two men, each uncomfortable with their public persona, become close friends. DAVIES: They kind of recognize something in each other which throws off the kingship and throws off the stage persona of Farinelli, and they're able to connect on a human level. LUNDEN: Davies is a major opera star, and van Kampen says it was a coup to get him to commit to a Broadway run from a first-time playwright. It might also seem a coup to get an actor of the caliber of Mark Rylance for the production, except he happens to be the writer's husband. RYLANCE: I'm just so proud of her and thrilled for her. And she's spent 25 years supporting me and giving me brilliant ideas without anyone realizing it was her. Now for her to be celebrated for the clever artist that she is gives me a great thrill. LUNDEN: Their collaboration was a success on London's West End, and "Farinelli And The King" is running on Broadway through March. For NPR News, I'm Jeff Lunden in New York. Transcript provided by NPR, Copyright NPR.